This site is a communication tool for baseball coaches and players to review effective strategy and techniques in every aspect of the game. If anyone has ideas to share, please email me at gkreber@cbcsd.org. I would love to post any specific drill or philosophy that has been successful in the area of player or team development. SWING FOR THE FENCES!! I am finally finished writing and re-writing my first book. Please check it out on Amazon. 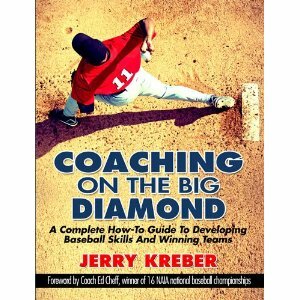 The material is a little different than your traditional "coaching" book. Any coach looking for some new, fresh ideas should really check it out. There is lots of stuff on pitching velocity, bat speed, player development, and team concepts. It is jammed packed with workouts, practice schedules, and pictures to help any coach spice up their program.